When it's the big fish you want, it's the big fish you'll catch with our colossal 12" sassy shad. 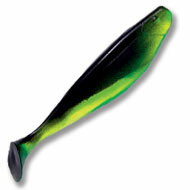 A must have for striper, pike, musky, etc. We've even had fisherman catch yellowfin with these baits. Made from premium PVC saltwater soft plastic, these shad can take a bite.